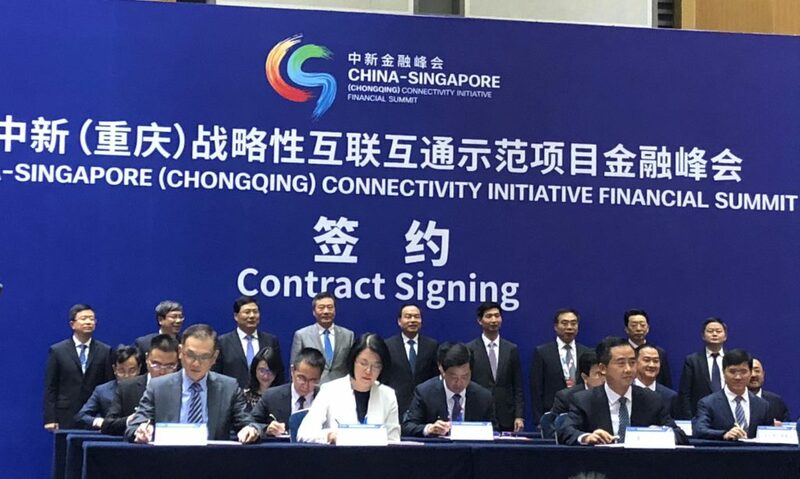 (Left) Mr Teo Eng Cheong, Surbana Jurong’s CEO International (Singapore, Southeast Asia and North Asia) signed the MOU at the China-Singapore (Chongqing) Connectivity Initiative Financial Summit. People’s Republic of China, 2 November 2018 – Surbana Jurong, one of the largest Asia-based urban and infrastructure consulting firms, further grows its footprint in China as it signed MOUs with the Chongqing Municipal Government and Danzhou Municipal People’s Government respectively. Together with China Construction Bank, Surbana Jurong signed an MOU with the Chongqing Municipal Government to provide support in various areas of the China-Singapore (Chongqing) Demonstration Initiative on Strategic Connectivity. Areas that the partners will jointly explore include the financing needs of major infrastructure construction, the potential development of a financial technology city and a digital economy pilot zone, the sustainable development of housing rental projects as well as smart cities projects. Chongqing is a major city in southwest China and only one of four municipalities under the direct administration of the central government. The China-Singapore (Chongqing) Demonstration Initiative on Strategic Connectivity is the third bilateral project between China and Singapore and is a strategic part of China’s Belt and Road Initiative (BRI). Surbana Jurong was the appointed masterplanner for the Chongqing Liangjiang New Area, providing the blueprint for the city to become a multi-modal hub. Today’s MOU develops from the collaboration agreement between Surbana Jurong and China Construction Bank signed in September this year, to jointly pursue and develop business opportunities arising from the BRI, and to provide industry leading services to clients in the Asia-Pacific region on possible infrastructure construction projects. Separately, Surbana Jurong has signed a collaborative MOU with the Danzhou Municipal People’s Government to explore collaboration in various areas including masterplanning and urban design. Danzhou is one of the major cities in Hainan province, a tropical island at the southern end of China. The Chinese government has recently earmarked Hainan as a Free Trade Zone (FTZ) that will span 35,400sqkm, which will make it the biggest FTZ in China. It aims to become an international shipping hub and a trading and investment gateway. The Danzhou government, through the MOU, plans to leverage Surbana Jurong’s global track record and success in planning and design to develop the city into a sustainable industrialised town, to promote investment and raise the living standards of its residents. Surbana Jurong has been established in China for the past two decades and been involved in over 2,000 projects, including the three China-Singapore bilateral projects. Surbana Jurong is one of the largest Asia-based urban and infrastructure consulting firms. Leveraging technology and creativity, Surbana Jurong provides best-in-class consultancy solutions across the entire value chain of the urbanisation, industrialisation and infrastructure domains. Headquartered in Singapore, the Surbana Jurong Group has a global workforce of over 14,500 employees in more than 130 offices across over 40 countries in Asia, Australia, UK, the Middle East, Africa and the Americas, and an annual turnover of around S$1.5 billion. Surbana Jurong has a track record of close to 70 years, and has built more than a million homes in Singapore, crafted master plans for more than 30 countries and developed over 100 industrial parks globally. Surbana Jurong’s motto ‘Building Cities, Shaping Lives’ reflects its belief that development is more than just steel and concrete. Surbana Jurong creates spaces and designs infrastructure where people live, work and play, shaping cities into homes with sustainable jobs where communities and businesses can flourish.